The UFDC convention starts today and I’m not there. One of the most wonderful aspects of convention is the fantastic shopping opportunities. 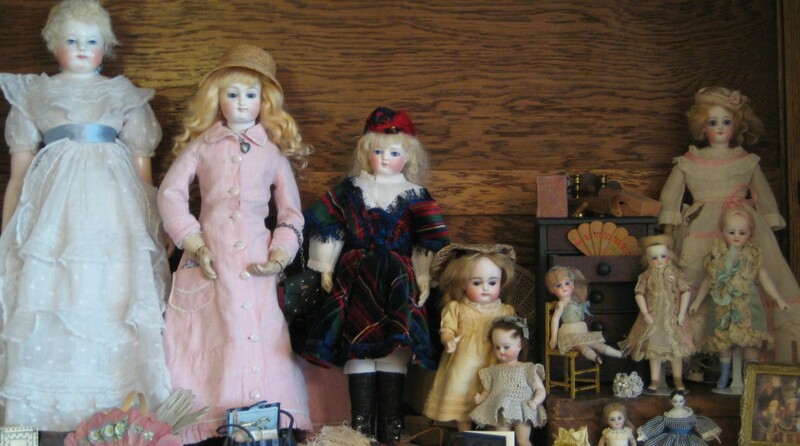 The UFDC showroom is legendary and Rowbear’s National Doll Festival, which runs concurrently, always inspires. I go back again and again during convention and find something new each time. I need a shopping fix and I have no where to go! Shopping online just isn’t the same. There used to be independent stores around every corner that featured varied and unique treasures to discover (not just clothing, housewares or electronics). They are gone, at least in my area of the country. I miss going shopping for nothing, just to shop, and finding something wonderful to bring home. It filled a need. It’s not about the great big purchases for me. It’s the little stuff. On opening night of convention, I usually take a cruise around the showroom to see the wonders before someone snatches them up. But, the rest of the time, I love to wander and search for small treasures. There are vendors from around the world who have all sorts of sewing stuff, from new and antique fabrics, to trims, laces, buttons, and threads. One year, I found this amazingly fine and beautiful, handmade petitpoint trim. It will eventually garnish a skirt for my Huret. 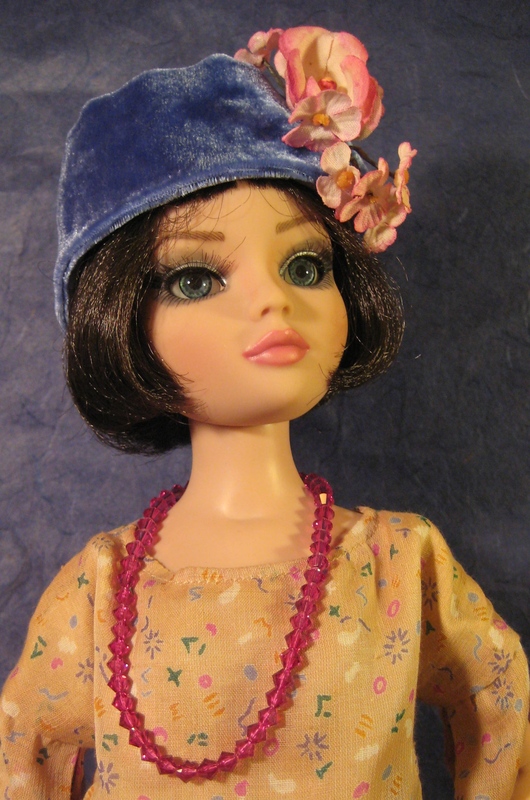 And this silk print and the coordinating BLUE silk velvet inspired this 1920’s outfit for my modern Ellowyne Wilde doll. Many dealers prefer that you do not take photos in their booths, so I always take a sketchpad and pencil with me because costume inspiration abounds. I’m a lousy sketch artist (no, I’m not going to share any of my sketches), but I add lots of notes about all the details I see. 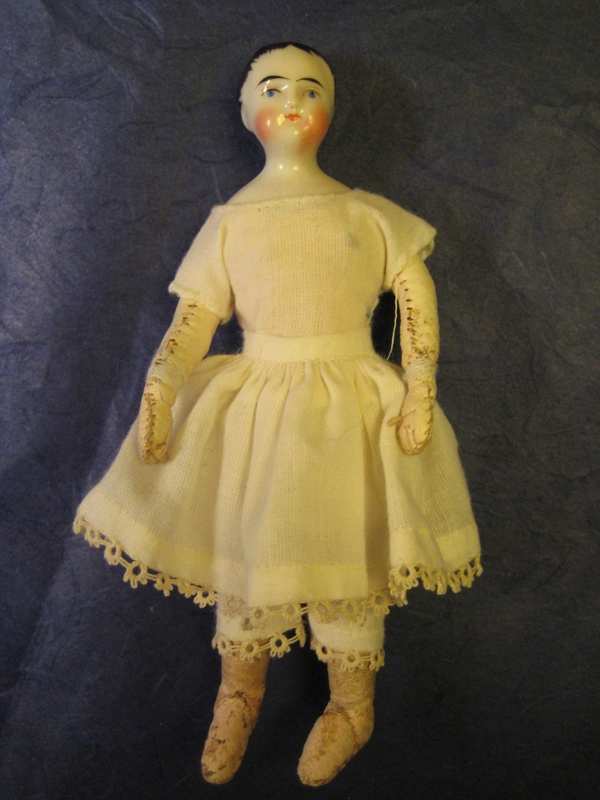 As a collector of small dolls, it is often hard to see them on opening night when the showroom is crowded. They hide in display cases, waiting for me to search them out. I found this gem (who still needs me to finish her clothes), in a display case on the last day of convention one year. I don’t know if she had been there all week or if the dealer just added her that day. But I felt like I had discovered gold! Do you miss shopping just to shop?